How was everyone’s weekend? Today I’m returning to home base (London) from my 10 days abroad with Katherine! I’m terribly sad to leave Prague – it quickly became a contender as my favorite city in the world. There’s such rich history, incredible architecture and a very lively culture. I can’t wait to share more from my trips soon! Since it’s technically still summer in London (albeit quite chilly), I’ve turned to my pale-shaded denim for a fresh look. This flared pair is a favorite I found at Stella McCartney earlier this spring. 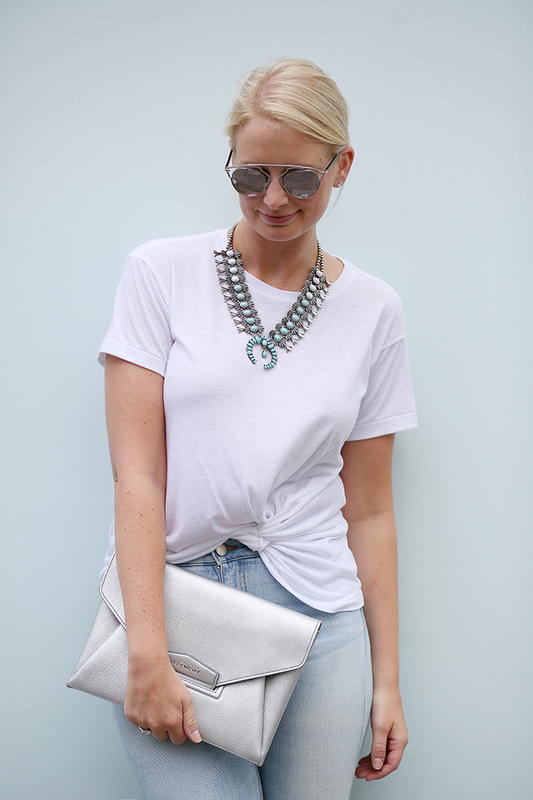 For a more casual vibe, I paired it with my most effortless tee from Club Monaco. The subtle twist/knot adds a little something extra, don’t you think? Finally, BaubleBar was so sweet and sent me a little care package when I arrived in London and I got some AMAZING pieces I wanted to share with you! This necklace is one of them. The combo of turquoise, white and silver scream summer, and the style feels very “Santa Fe” to me. A few other new arrivals worth a look include this leather tassel necklace, this simple bar ring, and these bright boho earrings. Finally don’t miss these geode studs – such a cute and understated set! you look stunning, love this outfit. Such a fun statement necklace! Can’t wait to see more Prague photos! This necklace has been on my wish list for a while – might need to finally pull the trigger! I am ALL about flares! From white jeans to dark washes and everything in between I love them. Love this in you. The flared jeans are awesome. Love this entire look! I’m on the search for the perfect flared jeans. These ones are great! Such a fun statement necklace! Really adds so much to the outfit. What a lovely outfit! Simple, yet chic. Love a good pair of flared denim! Love this outfit! It’s a perfect balance of casual and put together! Prague is one of my husband’s fave cities too – I’m dying to go! I’ve always wanted to go to Prague! I’ve heard it is amazing. I can’t wait to see your recap. This is such a simple chic outfit. I love your necklace! 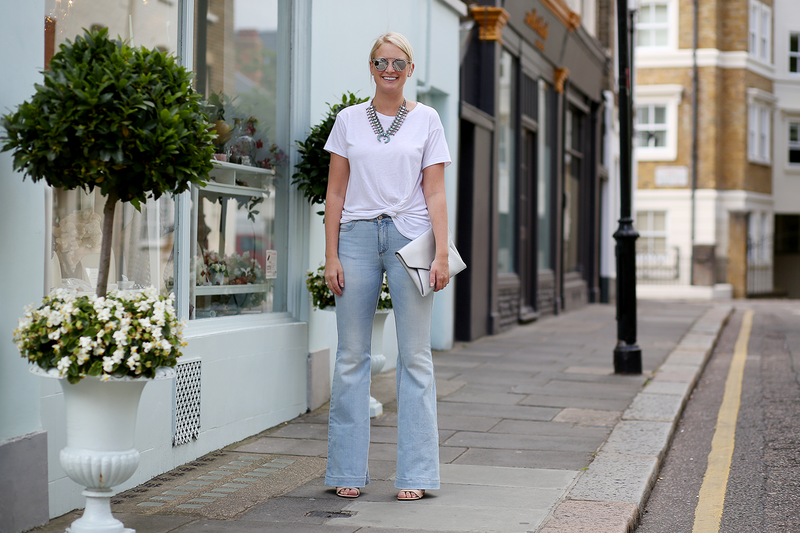 I love your simple styling and these flares are an absolute dream! I LOVE this necklace. It’s so cool. Santa Fe was one of my favorite places I’ve visited in the US. You look great in the flares. such a cool girl vibe with this! i love how relaxed/chic yet totally put together you look. awesome! Love the flared silhouette, been loving your travel pics! Love the 70s vibe of this ensemble!! I am loving the lighter shade of these flares! They’re so perfect!